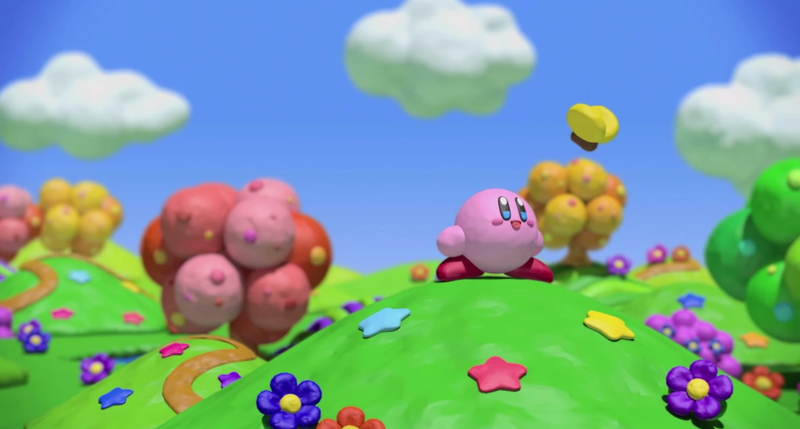 Despite his iconic presence as one of Nintendo's foremost disgustingly cute characters, Kirby hasn't had a good, solid game of his own in a while. And while Kirby and the Rainbow Curse is taking a quirky route to stardom, this new trailer for the Japanese version of the game makes me think that's a good thing. Rainbow Curse is a sequel to the cult favorite Kirby game Canvas Curse. It was first announced at this year's E3. The game is coming to the Wii U in February. I think many Nintendo observers put this game in a similar camp as Captain Toad Treasure Tracker. There's been some speculation, then, that it will be similarly priced at around $40. Major U.S online retail listings still put it at the standard $60 mark, though. In either case, the popular conception is that this is going to be one of Nintendo's "side games" for the Wii U, so to speak—a fun, if relatively unsurprising game for one of the company's perennially b-listed characters, as Stephen described the pink blob to me this morning. They waited until the remarkable new Super Smash Bros. was out to drop it, after all—a decision that's undoubtedly based on the recognition that many more gamers (especially here in the U.S.) are more familiar with Kirby as a character in that game. Kirby's Smash reputation is indicative of an overarching trend in his career: whether he's perennially b-listed or his diminished reputation is a relatively recent phenomenon, he hasn't made a big splash yet in this Nintendo hardware generation. His most recent game was the 3DS side-scroller Triple Deluxe. It was fun for a platformer, but not a great leap forward for the larger genre like Super Mario 3D Land was. Or Return To Dream Land, its 2011 sort-of-predecessor for the Wii, for that matter. The Wii U is my first Nintendo console, so I don't have the same level of experience with Kirby as many more jaded fans of the company's work do. I'm a little bummed that I won't be starting out in the glory days of Kirby side-scrollers, then. But...well, maybe it's because of my relative Nintendo naiveté, but I actually think it's good that this is the Kirby game we're getting. The Wii U already has a number of great platformers. Super Mario 3D World is the best by far, but there's also Donkey Kong Tropical Freeze, New Super Mario and Luigi games, even Rayman Legends. Plus, the console is also getting Yoshi's Woolly World soon. So there's already one ridiculously adorable Nintendo platformer on the immediate horizon. Do we really need two? I'd much rather see Kirby show what the Wii U is truly capable of, in its own special way. Because while I haven't played Rainbow Curse yet, it looks very promising. The trailer makes it look like you'll be using drawing in a bunch of cool ways. Man. Why isn't it February yet?